Apparently, a Brix can change quite a bit in appearance and still remain a Brix. When Gigabyte first launched the line, it was a reference to lookalike versions of Intel’s Next-Unit-of-Computing (NUC) systems: bare-bones machines in the form of 4x4-inch blocks. Then it expanded to encompass teeny-tiny tower versions of said mini-PCs (like the Brix Gaming UHD). Now the term includes the Gigabyte PC, a 10-liter small-form-factor PC. This “Gaming GT” line of Brix systems sports full desktop-sized CPUs and GPUs, and sells as complete machines with Windows 10 Home installed. This addition to the Brix lineup is a little surprising, given the history of itty-bitty systems that you had to kit out yourself. But more startling (and disappointing) is the mixed experience of using the Gigabyte PC: You get great performance, but with the cost of a lot of fan noise. Given the history of Brix machines that blasted so shrilly you could hear them from clear across a house, you could argue that the Gigabyte PC is indeed a chip off the old block. Its level of noise varies between loud and shrill during CPU loads, and just loud during GPU loads. But unlike its smaller siblings, you can’t dismiss the Gigabyte PC as easily to a sound-dampening cubby—this machine is meant to be seen. 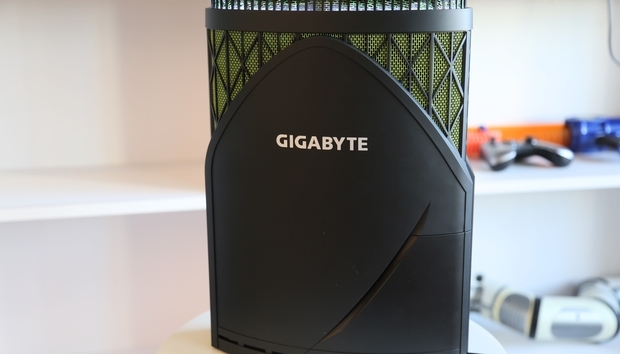 Besides the neon-green mesh and programmable LEDs, the Gigabyte PC features an attention-grabbing venting system: Once internal temperatures reach a certain point, the two flaps up top should automatically lift open. Now, our review unit didn’t actually do this automatically, not even when I hammered on it with Prime95 and Furmark. My guess is that because our unit came to us before CES, the utility or BIOS settting that kicks the doors open wasn’t ready yet. But when I gently experimented with manually opening the flaps to see how it affected fan noise (spoiler: it didn’t), the look turned heads, for sure. More than one person in our office stopped and inspected the Gigabyte PC as I ran benchmarks. Port placement also is uniquely tailored for a life of sitting out in the open. You’ll only see a handful of inputs along one of the narrow sides of the machine: separate headphone and microphone jacks, and two USB 3.0 Type-A ports. It’s equivalent to what you’d find on the front or top of a standard desktop case. The bulk of the ports live underneath a panel on one of the case’s broad sides, as well as along the bottom of the machine. Under the side panel are an HDMI port, three USB 3.0 Type-A ports, a Thunderbolt 3/USB 3.1 Type-C port, and a DC-in power jack, while the bottom section holds a power connector, audio jacks, a gigabit ethernet jack, and the included GTX 1070’s video connectors (three DisplayPort, and one each DVI-A, DVI-D, and HDMI). All wires feed out from the bottom of the case—an opening exists on each narrow side for routing. The design keeps this small system from becoming dominated by plugs and wires. Of course, looks might not be enough to entice someone to keep a machine on a desk. But I’d still be hesitant to hide this machine away, even if I hated its appearance. Opening those vents failed to really affect fan noise and internal temperatures, and tucking it somewhere with limited air flow might be a bad idea. It’s pretty densely packed inside. Our configuration came fully stuffed with high-end hardware: an overclockable Intel Core i7-6700K Skylake processor, an ever-so-slightly overclocked desktop Nvidia GTX 1070 graphics card, 16GB of DDR4/2133 RAM, a 256GB Transcend SATA 6Gbps SSD, and a 1TB hard-disk drive from HGST. Also included is an Intel Wireless-AC 3165NGW dual-band card. Gigabyte quoted us a price of roughly $1,700 at press time for our review unit, but that may not be the final amount, as the official version of this Gigabyte PC (the GB-GZ1DTi7-1070-NK-GW) comes with a 240GB SSD. Regardless, it’ll cost more than a comparable DIY small-form factor build, which would run about $1,485 to $1,510. A quick glance at Newegg shows current prices of about $330 for the processor, $430 for a similar graphics card, $100 for RAM, $100 for the SSD, $60 for the hard disk drive, $150 for a motherboard, $120 for a gold-rated modular 600W power supply, $75-$100 for a mini-ITX case, and $120 for a retail copy of Windows 10 Home. You’re definitely paying a little bit of a premium. Of course, you can’t exactly replicate the ultra-compact nature of this machine with standard off-the-shelf parts. And if money doesn’t matter overly much to you, you do get all the performance you’d expect out of the Gigabyte PC’s included hardware, even despite its cramped quarters. For our tests, we left the CPU at its stock speed of 4GHz, as we don’t expect the chip to overclock much. Space is tight in this machine, and CPU temps rose to about 100°C during stress testing. It stayed stable there at both the 60-minute and 90-minute marks of running Prime95, but not much of a margin exists for pushing up the clock speed. The GTX 1070 graphics card also ran at its default settings, which were a slightly overclocked 1,595MHz base speed and 1,785MHz boost speed. The start of our benchmark gauntlet was Maxon’s Cinebench R15, which leans heavily on the CPU for a few minutes while the test renders a 3D scene. When we run this test, we don’t expect to see much of a difference between similarly configured PCs. However, if the results do look unusual, it can indicate either an unexpected design philosophy or actual issues. In the case of the Gigabyte PC, its score closely hews to those of other small form factor PCs with the same processor. It technically outdoes the soon-to-be-reviewed Cerise PC by a tiny margin, but stays just behind the Alienware X51. The X51’s performance is noteworthy because of how quietly the machine runs—at a soft hum, versus the Gigabyte PC’s audible blast of fans. While Cinebench shines a light on how a machine handles short bursts of CPU activity, our Handbrake benchmark reveals how a system’s processor handles extended loads. This real-world encoding test involves taking a 30GB MKV file and using Handbrake’s Android Tablet preset to crunch it down into a much-smaller MP4. It hammers hard on a CPU and scales well with core count. The Gigabyte’s Core i7-6700K should chew through its task in under 40 minutes, which it does. Overall, the Gigabyte PC, Alienware X51, and the Cerise all manage to finish the task in about the same amount of time. The Alienware X51, though, still stays quieter throughout, and that difference makes the Gigabyte PC’s performance a tiny bit disappointing. Why Fire Strike, which is designed for systems with less powerful graphics cards, and not Fire Strike Extreme or even Fire Strike Ultra? Well, I wanted to include our PCWorld zero-point machine (and its GTX 980) in our chart to give broader context to the Gigabyte PC’s performance, but it was temporarily out of commission and unable to cough up a Fire Strike Ultra result. So, I had to fall back on its existing Fire Strike score. Though this synthetic test went a little easier on the Gigabyte PC than its Extreme or Ultra variants, you can still see that this PC’s GTX 1070 keeps even pace with those in the Cerise and Dell’s XPS Tower. That card also handily lays a beat down on the GTX 980 in our zero-point machine—solid proof of that monumental leap from Maxwell to Pascal. As for the Alienware X51, it might be quieter, but its more modest last-gen GTX 960 relegates it to the bottom of the heap in this benchmark. Moving on to a real game, we pulled up the creaky but still reliable Tomb Raider. At four years old, it should be an easy task for the systems running Pascal graphics cards—and it is, though the Gigabyte PC still blasts its GTX 1070’s fans. In fact, that’s probably the most interesting part about all of these results. The Gigabyte PC edges out its fellow GTX 1070 contemporaries by a small margin—some more than others, because games can sometimes rely on the CPU, too. But the noise! You’d think that with an older game, Gigabyte’s machine wouldn’t work its fans so hard, but that’s not the case. Though the sound isn’t shrill, like when the CPU’s under load, it’s still loud. That said, getting over 90 fps at 2560x1600 is pretty sweet. That’s Pascal for you. Moving on to a newer game shows more of the GTX 1070’s limits. The sequel to Tomb Raider is just over a year old and features some incredibly pretty graphics. Accordingly, playing it at 2560x1600 is much more punishing. Still, you get framerates above that desired threshold of 60 fps. In fact, the Gigabyte PC even manages to lead the pack. Those noisy fans do enable solid performance, because Gigabyte’s gigantic Brix machine is able to edge out a micro-ATX build with more airflow (the Avant Tower). The Gigabyte PC is a powerhouse. The problem is that despite performing so well, it’s hard to ignore how noisy it is. Granted, what's a headache-inducing din for one person can be a bearable murmur for someone else. But while this oversized Brix isn’t nearly as shrill as some of its tinier (and older) siblings, it's still clearly audible. Every single coworker that stopped to examine it would comment about its design, compliment its color scheme, prod at its flaps...and then remark on the roar of its fans. It’s a real shame, because the Gigabyte PC seemed poised to fill the void of Alienware’s discontinued X51: a ready-to-go gaming PC that was sleek, compact, quiet, relatively affordable, and bursting with performance. Instead, it’s best suited for people who don’t mind turning up the volume on their speakers or headsets. The Alienware X51 (left) and Gigabyte PC GZ1DTi7-1070 (right), side by side.